4 x 12 Heavy Gauge Steel Floor Register Discounts Apply ! 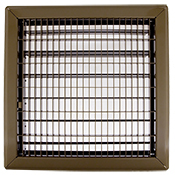 This Hart & Cooley Inc. commercial grade steel vent is a brown floor register with an adjustable metal damper that can be opened or closed completely. It features a sturdy all steel construction with Hart & Cooley Inc. commercial grade strength, providing you with a resilient product that will perform well, even in high traffic areas. Its adjustable metal damper is conveniently toe-operated, so you can easily adjust air flow. The neutral, light brown finish blends in well with any number of decors or color schemes, whether it is installed in a residential or commercial setting. Please allow a few weeks for this product to arrive, as it is a special order item. For your other vent needs, we also offer heavy gauge steel floor grilles without dampers, which allow for continuous air flow. Regarding measurements: To ensure you are making the correct measurements, please measure the actual hole into which the floor vent will be placed. Do not measure faceplate dimensions, as this will provide you with thewrong register measurements. For instance, if floor hole size is 4 x 10 inches, please order a 4 x 10 inch register. Faceplate dimensions are 5 13/16 x 13 13/16 inches with an approximate faceplate thickness of 3/16 inch. Damper will drop into the hole approximately 2 7/8. See enlarged photo for vent and damper details.